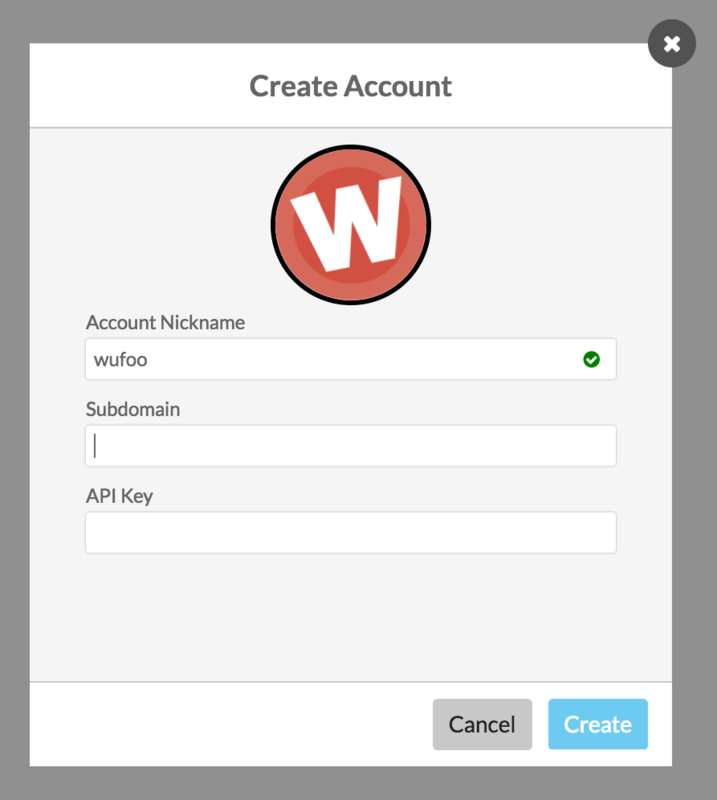 To authenticate Wufoo, you’ll need your subdomain and your API key. To find the subdomain, you will need to first log into Wufoo. Once logged in, you can simply copy the subdomain from the your URL bar. Your URL will have the form “https://your-subdomain.wufoo.com". To the right of the form, hover over More and click API Information. Copy your API Key, or look at the table to find your form’s hash or field API IDs. 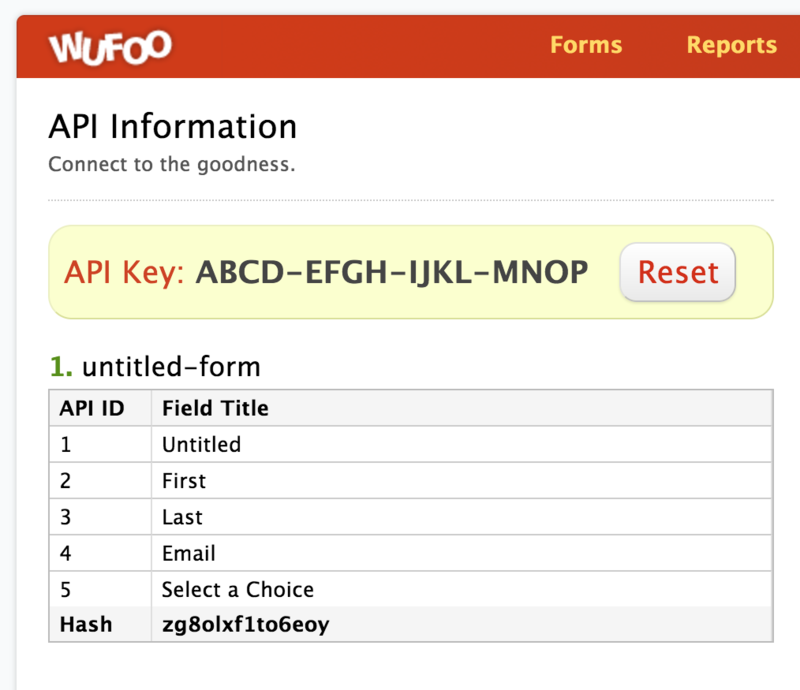 Wufoo’s documentation on finding your API Key is here. Runs the FLO whenever there is a new entry for a form. This event uses a webhook so there is no need to set how often to check Wufoo – the FLO should run as soon as the new entry is added. Every time a FLO is activated using this card Wufoo will be checked for a corresponding Webhook. If a Webhook doesn’t exist, then this card will create a new Webhook. Different Wufoo plans have different limits on the amount of Webhooks they can use. If the card isn’t able to create a Webhook, then it will fail to activate. To fix this error Webhooks in Wufoo need to be deleted. Your Forms: Choose from the dropdown the Wufoo form you want to monitor. EntryID (text): The ID that Wufoo uses to refer to the new entry. To get the values that were entered into the form, you’ll need to add a Read Entry card to your FLO and then pass this ID into the ID input on the Read Entry card. Execution ID (text): This output field appears on every event card and is the unique ID to identify the execution instance (primarily used for advanced debugging purposes). Given an Entry ID, gets the values that were entered into a form. Your Forms: Choose from the dropdown the Wufoo form you want to read values from. EntryID (text): The ID that Wufoo uses to refer to the new entry. Metadata: This section of outputs is the same for every form entry. Created Date (text): The date and time that this entry was submitted, in the timezone of the user who submitted the entry. Created By (text): The person who created the entry, or “public” if the entry was created through a public web form. Updated Date (text): The date and time that this entry was edited through Wufoo’s Entry Manager. If the submission has never been updated, this value is blank. Updated By (text): The person who updated the entry in Wufoo’s Entry Manager; otherwise, blank. Answer: This section of outputs contains the list of fields that are in the form. NOTE: These fields are not on by default – you have to use Choose Fields to select the values you want to use in your FLO. Choose Fields pops up automatically when you first insert the card or you can get back to it anytime by clicking the cog at the bottom right of the card. Creates a new entry for a Wufoo form. Your Forms: Choose from the dropdown the Wufoo form you want to create an entry for. Entry: The inputs are dynamically generated to match the inputs for the selected form.